← God(s) Help Us All! Herma of Seneca (opposite: Socrates). – Image source here. 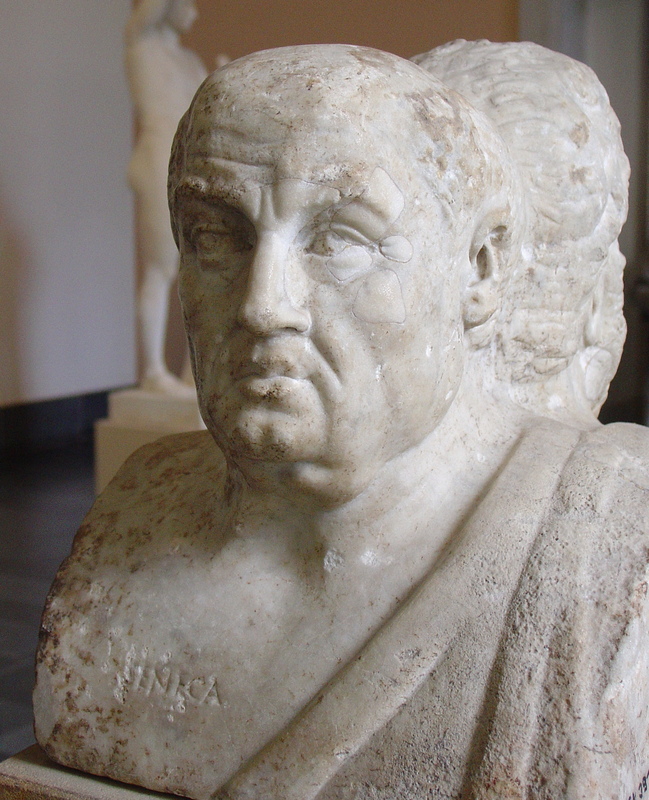 In A. D. 41, long before he became one of Rome’s most powerful political figures, the Roman politician, Stoic philosopher, and writer Lucius Annaeus Seneca got to experience first hand what hundreds of thousands of people are enduring at the moment: a change of scenery, forced upon him by political circumstances. Somewhat deviously charged with adultery with Julia Livilla, Emperor Caligula’s youngest sister, who had fallen out of favour with Messalina, Seneca in a fait accompli was exiled to Corsica. Being the cause of grief to his mother Helvia, Seneca in his work De consolatione ad Helviam matrem reflects on the nature of his forced displacement, on the nature of displacement in general, and on the nature of human migration. Setting aside, then, the verdict of the majority, who are carried away by the first appearance of things and the usual opinion about them, let us consider what is meant by exile: clearly a changing from one place to another. That I may not seem to be narrowing its force, and taking away its worst parts, I must add, that this changing of place is accompanied by poverty, disgrace, and contempt. “Look, I pray you, on these vast crowds, for whom all the countless roofs of Rome can scarcely find shelter: the greater part of those crowds have lost their native land: they have flocked hither from their country towns and colonies, and in fine from all parts of the world. Some have been brought by ambition, some by the exigencies of public office, some by being entrusted with embassies, some by luxury which seeks a convenient spot, rich in vices, for its exercise, some by their wish for a liberal education, others by a wish to see the public shows. Some have been led hither by friendship, some by industry, which finds here a wide field for the display of its powers. Some have brought their beauty for sale, some their eloquence: people of every kind assemble themselves together in Rome, which sets a high price both upon virtues and vices. Bid them all to be summoned to answer to their names, and ask each one from what home he has come: you will find that the greater part of them have left their own abodes, and journeyed to a city which, though great and beauteous beyond all others, is nevertheless not their own. Rome, as described by Seneca in this passage, provided a home to a significant migrant community – a community of displaced people, of people living away from where they were born and raised. Seneca, again quite deliberately for his own argumentative purposes of course, does not substantially distinguish between the various groups of displaced people; he mentions refugees and slaves (‘the greater part of those crowds have lost their native land’), soldiers of fortune (‘brought by ambition’), ambassadors (brought to Rome ‘by the exigencies of public office’ or ‘entrusted with embassies’), shady businessmen (driven ‘by luxury which seeks a convenient spot, rich in vices, for its exercise’), overseas students (with a ‘wish for a liberal education’), and event tourists (with a ‘wish to see the public shows’). Personal relationships, political ambition, entrepreneurship – there are many more reasons, according to Seneca, why one might have ended up in Rome (who, as a Spaniard living in Rome, must be included in those numbers himself). What they all have in common, however, is this: they ended up in a place that was not their home – an experience that Seneca now came to share with them, losing his elected adoptive home, Rome, at least temporarily. Some have been tossed hither and thither by long wanderings, until they have become too wearied to choose an abode, but have settled in whatever place was nearest to them: others have made themselves masters of foreign countries by force of arms: some nations while making for parts unknown have been swallowed up by the sea: some have established themselves in the place in which they were originally stranded by utter destitution. Nor have all men had the same reasons for leaving their country and for seeking for a new one: some have escaped from their cities when destroyed by hostile armies, and having lost their own lands have been thrust upon those of others: some have been cast out by domestic quarrels: some have been driven forth in consequence of an excess of population, in order to relieve the pressure at home: some have been forced to leave by pestilence, or frequent earthquakes, or some unbearable defects of a barren soil: some have been seduced by the fame of a fertile and over-praised clime. Different people have been led away from their homes by different causes; but in all cases it is clear that nothing remains in the same place in which it was born: the movement of the human race is perpetual: in this vast world some changes take place daily. The foundations of new cities are laid, new names of nations arise, while the former ones die out, or become absorbed by more powerful ones. And yet what else are all these general migrations but the banishments of whole peoples? Why should I lead you through all these details? what is the use of mentioning Antenor the founder of Padua, or Evander who established his kingdom of Arcadian settlers on the banks of the Tiber? or Diomedes and the other heroes, both victors and vanquished, whom the Trojan war scattered over lands which were not their own? It would be shortsighted, however, to describe the whole process as a one-way street. Very much in line with the view that he held initially, namely that there are very many different shades of a common phenomenon – displaced human beings, humans who were led away from their homes for whatever reason –, Seneca makes it blatantly clear that even those countries that may perceive themselves at the receiving end of substantial numbers of migrants should be aware of their own role in history. It is a fact that the Roman Empire itself traces its origin back to an exile as its founder, who, fleeing from his country after its conquest, with what few relics he had saved from the wreck, had been brought to Italy by hard necessity and fear of his conqueror, which bade him seek distant lands. Since then, how many colonies has this people sent forth into every province? wherever the Roman conquers, there he dwells. Those who believe that they can cement an (alleged) status quo wish to make believe with their facile and populist, yet deeply inhumane and in fact inhuman, arguments that human migration, exile, and refuge are threatening the safety and stability of our civilisation – not seldom resorting to dehumanising language when talking about those who have lost everything and are already fighting for their very lives. Seneca draws attention to the fact that the contrary is true: those who think that they can cement the (alleged) status quo are the ones who act against the flow of nature. There is no stability of the human condition on this planet – there never has been and there never will be, however deceptive short periods of peacefulness may be. One may be afraid of that, or alternatively, as Seneca does, choose to derive hope from it – accepting reality and acting in accordance with it. But what hope can there be for countries, governments, and people that choose to deny help, humanity, and being a ‘safe haven’ to refugees and migrants – or as I prefer to call them: human beings? ‘Do unto others as you would have them do unto you,’ they say. Present approaches to the world-wide refugee crisis and human migration may make one fear for the worst if others ever get to do unto us as we are doing unto them presently. This entry was posted in Prose and tagged Big questions, Fortress Europe, Humanity, Migration, Refugee Crisis, Seneca the Younger, Sustainability. Bookmark the permalink.